The demise of some of China's ruling dynasties may have been linked to changes in the strength of monsoon rains, a new study suggests. The findings come from 1,800-year record of the Asian monsoon preserved in a stalagmite from a Chinese cave. Weak - and therefore dry - monsoon periods coincided with the demise of the Tang, Yuan and Ming imperial dynasties, the scientists said. A US-Chinese team report their work in the journal Science. Stalagmites are largely made up of calcium carbonate, which precipitates from groundwater dripping from the ceiling of a cave. Chemical analysis of a 118mm-long stalagmite from Wangxiang Cave, in Gansu province, north-west China, told the history of strong and weak cycles in the monsoon - the rains that water crops to feed millions of people in Asia. It also shows that, over the last 50 years, greenhouse gases and aerosols have taken over from natural variability to become the dominant influence on the monsoon. 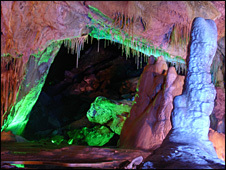 Small variations in the forms, or isotopes, of the stalagmite's oxygen composition reflected variations in rainfall near the cave. 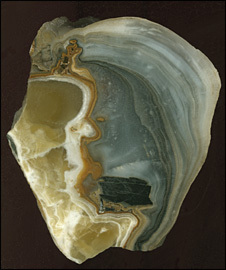 Proportions of the radioactive elements uranium and thorium in the deposit allowed the researchers to date the stalagmite layers to within an average of two-and-a-half years. By comparing the rain record with Chinese historical records, Pingzhong Zhang of Lanzhou University in China, and colleagues, found three out of five "multi-century" dynasties - the Tang, the Yuan and the Ming - ended after several decades of weaker summer monsoons with drier conditions. "Summer monsoon winds originate in the Indian Ocean and sweep into China," said Hai Cheng, co-author from the University of Minnesota, US. "When the summer monsoon is stronger, it pushes farther north-west into China." This could have led to poor rice harvests and civil unrest, the researchers speculate. "Whereas other factors would certainly have affected these chapters of Chinese cultural history, our correlations suggest that climate played a key role," the researchers write in Science. But a weak monsoon could also be linked to changes further afield. The researchers say a dry period between 850AD and 940AD coincides not only with the decline of the Chinese Tang dynasty but also with the fall of the Mayan civilization in America. Subsequent strengthening of the monsoon may have contributed to the rapid increase in rice cultivation, a dramatic increase in population and general stability at the beginning of China's Northern Song Dynasty. The monsoon record also matched up nicely with the advance and retreat of Swiss glaciers. Scientists say the natural archive shows that climate change can have devastating effects on local populations - even when this change is mild when averaged across the globe. In the cave record, the monsoon followed trends in solar activity over many centuries, suggesting the Sun played an important role in the variability of this weather system. To a lesser extent, it also followed northern hemisphere temperatures on a millennial and centennial scale. As temperatures went up, the monsoon became stronger and, as they dropped, it weakened. However, over the last 50 years, this relationship has switched. The researchers attribute this to the influence of greenhouse gas emissions and sulphate aerosols released by human activities.